At CEDIA Expo 2018 in San Diego, Epson will launch its latest UHD 4K-friendly projector, the Pro Cinema 4050 Pro-UHD with HDR. The new Epson Pro Cinema 4050 incorporates the company's new 4K PRO-UHD technology and 12-bit processing. Helping to add more competition to the thriving 4K projection market, Epson will introduce its new Pro Cinema 4050 Pro-UHD with HDR projector at CEDIA Expo 2018. Exhibiting in booth #5734 during the annual trade event, the company’s latest custom installation video solution employs its proprietary 4K PRO-UHD technology. “With expansive brightness, brilliant color-rich imagery and state-of-the-art pixel-shift technology, the new Pro Cinema 4050 4K PRO-UHD allows viewers to enjoy remarkable 4K UHD content that is nothing short of amazing,” states Rodrigo Catalan, senior product manager, projectors, Epson America. The Pro Cinema 4050 is Epson's first product to incorporate the 4K PRO-UHD technology. According to the company, the Pro Cinema 4050 and its 4K PRO- UHD technology utilizes an advanced optical engine that products high-color brightness levels, as well as high white levels, and accurate colors. Moreover, Epson says the projector’s compatibility with the HDR10 format will allow the Pro Cinema 4050 to produce wide contrast levels. 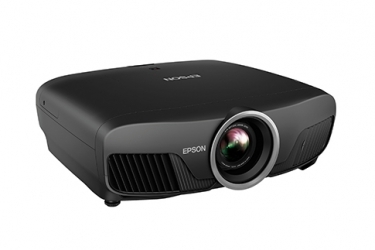 Epson emphasizes the Pro Cinema 4050 delivers detailed, bright, dynamic images, thanks in part to its PRO-UHD technology, combined with the projector’s lens capabilities and compatibility with native 4K content through its latest-generation of pixel-shifting technologies. Specified to produce up to 2,400 lumens of color and white brightness, the Pro Cinema 4050 produces contrast ratios as high as 200,000:1. The projector also has integration-friendly features like wide lens shift capabilities with +/- 96 percent on the horizontal axis and +/- 47 percent vertical axis. In addition, to help a wide variety of images look better, the 4050 uses a 12-bit digital processing chipset that provides frame interpolation and Epson’s Advanced Motion Control image processing for smooth transitions between frames. The Pro Cinema 4050 features Epson’s latest generation pixel shifting to deliver UHD 4K compliant images. Through the inclusion of 4K PRO-UHD technology, the Pro Cinema 4050 produces high color and white brightness levels, and wide dynamics through HDR10 compatibility. Epson ships the Pro Cinema 4050 with a ceiling mount, cable cover, and an extra lamp. Installer-friendly features include vertical and horizontal lens shift and a 3-axis motor for powered focus and 2.1x zoom.